Healing leaky gut requires time to fully restore intestinal lining back to small pores so no particles or pathogens escape into the bloodstream. You will have to experiment with foods through trial and error to see what triggers symptoms, and know what your body needs for nutrients and general gut health. I’ve written 7 steps to help simplify the process for healing leaky gut syndrome, split up into three sections for changes to make before you begin, while you heal, and maintaining long term health. Before you begin changing your diet, be aware of factors outside of food that can contribute to leaky gut and inflammation. Continuous stress not only creates leaky gut by contributing to inflammation and expanding the intestinal pores, but also wears down the immune system, adrenals, and the body’s own healing ability. While many of us have stressful jobs, even if we enjoy them, or we don’t get proper sleep, taking time out of the day to recognize and address the stress is critical. Supplements for stress are available, however they are to supplement, not replace, taking time to relax. Savor food by taking in the scent before a first bite, chewing it slowly and down to a mush, and spending time to taste. Antibiotics, painkillers, and other medications can be difficult to digest, create inflammation in the gut, and prevent healing. Avoid NSAIDs and antibiotics as much as possible, but talk to your doctor before attempting to cut back on any prescriptions. Intestinal walls cannot heal themselves if the gut is harboring excessive bad bacteria, Candida overgrowth, and/or parasites. Not only do these pathogens leak into the bloodstream and overwork the immune system, they can attach to the intestinal walls and maintain inflammation. If you want to have a detailed understanding of your gut health, you can read about testing options for leaky gut syndrome, which includes options for analyzing pathogenic levels. Whether or not you’re interested in determining your exact gut health, you can take supplements to cleanse and maintain probiotics and healthy Candida levels. See step 6 for more information on specific supplementation. If you begin a diet, and are not seeing results after removing common irritants, testing for parasites or going through a full body cleanse may be in order. There are different recommended diets, and you can mix and match them depending on how much cleansing your body needs, what your lifestyle will allow regarding drastic changes, and what foods you find you personally can embrace or avoid. You can read more about the specific diet options in my related article. Each diet will involve removing additives, sugars, and other nutrients harmful to the gut. For more complete list on foods to remove in the diet, see foods to avoid. The simple key to a diet, which can be difficult to implement, is to replace trigger foods and unhealthy ingredients with homemade meals and snacks made from fresh, preferably organic, ingredients. Snacks and meals may be made ahead of time and heated up on the stove or in the oven (avoid microwaves as the radioactivity may kill nutrients) if time is short during the week. Try not to consume anything beyond 2 days old, unless it has been frozen, in which case no more than 60 days old. For a more complete list of foods to incorporate into your diet, I’ve written a guide on foods to eat. Increased intestinal permeability not only allows particles into the bloodstream, but weakens proper absorption of nutrients from food. People are often deficient in at least one vitamin or mineral, and prone to getting sick or having chronic yeast or other infections. The following list of supplements should be taken while healing. Multivitamin: A good multivitamin without additives is critical to make up for any nutritional deficiencies. Food-based, or better yet, whole food multivitamins will source most ingredients from food, thus allowing increased absorption with a gentler process to break down the nutrients. Zinc: A common mineral deficiency, zinc supports the immune system and healthy intestinal walls. Excessive Candida sends organisms out to pull away and destroy zinc in the body, thus worsening the body’s ability to heal. Up to 30mg of zinc can be taken a day for those in a normal range. Learn more about the health benefits of zinc and how it relates to Candida. Probiotic: A good probiotic like Canxida Restore contains good bacteria to support immunity, healthy digestion, and a proper balance of good-bad bacteria in the body. What I love about the product, too, is that it includes digestive enzymes, which help break down food to properly absorb nutrients and prevent bloating, cramping, acid reflux, constipation, or diarrhea. Cleansing Blend: While healing the gut, intensive cleanses can be a strain on the body. 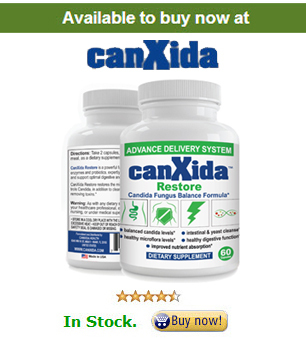 I take Canxida Restore to help reduce excessive Candida and keep a balanced body. Other considerations: B12 is another common deficiency for those with leaky gut. L-glutamine is an amino acid known to support intestinal lining, and may help speed up the gut’s healing process. Digestive enzymes (which can be coupled with probiotics) help support properly digesting food and preventing common symptoms that cause discomfort after eating. Many report that after their leaky gut is healed, they can go back to consuming foods they were previously allergic to, as the particles no longer go into the bloodstream and alert the immune system of a trespassing. Depending on the intensity of your leaky gut, the healing process can take anywhere from 30-60 days, or years. People will no longer have symptoms, and have better energy and moods. You can always retest your symptoms to see if your risk has lowered (which would indicate healing!) with my online quiz. When reintroducing foods, such as gluten-containing foods like wheat, or dairy, begin with small amounts as part of a light snack or included in a meal. Slowly build up your consumption, but always eat moderate amounts. Certain substances, such as sugar and additives, should continue to be avoided. An occasional dessert or quick can of soup shouldn’t hurt, however keep these splurges rare. Maintaining healthy habits even after the digestive tract is repaired is critical to maintain health and prevent future problems. Maintain a healthy diet, avoid medications as much as possible (this does not include supplements), continue on a probiotic, and continue good eating habits. Ensure that you maintain and continue to develop techniques to help relax.